Mumbai, Aug 26 (IANS) Monu Goyat scored 11 points as the raider inspired Patna Pirates to a crushing 35-24 win over Tamil Thalaivas in a Zone B contest of the Pro Kabaddi League (PKL) here on Saturday. Patna Pirates now have 27 points after seven matches and are second in the zone, while sixth-placed Tamil Thalaivas crashed to their fourth defeat of the season and have 14 points after seven matches. Both teams scored tackle points in three minutes to tie the game at 1-1. Ajay Thakur scored first raid point for the Thalaivas in the fourth minute as they led 3-1. Patna raiders were struggling in the first minutes and couldn’t score a point as they trailed 2-5. Even the Tamil raiders couldn’t get going and scored just one point to lead 7-4 in the 13th minute. Patna forced a super tackle in the 14th minute as they trailed 6-8. Vinod Kumar scored Patna’s first raid point in the 16th minute as they levelled the game at 8-8. Pardeep Narwal scored his first point of the match in the 19th minute as Patna Pirates led 11-8 and reduced Thalaivas to just one man. Patna inflicted an all out in the 20th minute and Pardeep followed it up with a two-point raid as they led 16-9 at half time. The second half began with both teams trading a few points as Patna led 18-12 after 26 minutes. Goyat scored with a two-point raid in the 27th minute to give Patna a 20-13 lead. 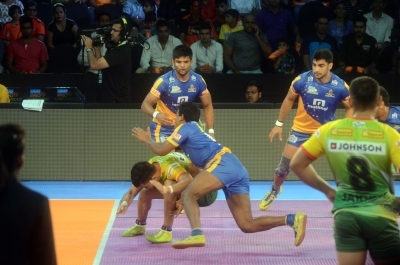 Thalaivas scored three points in two minutes as they trailed 16-22 after 29 minutes. Goyat came up with a super raid in the 32nd minute as Patna inflicted an all out to lead 28-16. With less than five minutes to go Patna led 32-18 and were in complete control of the match. Afterwards, it became easy for Patna.